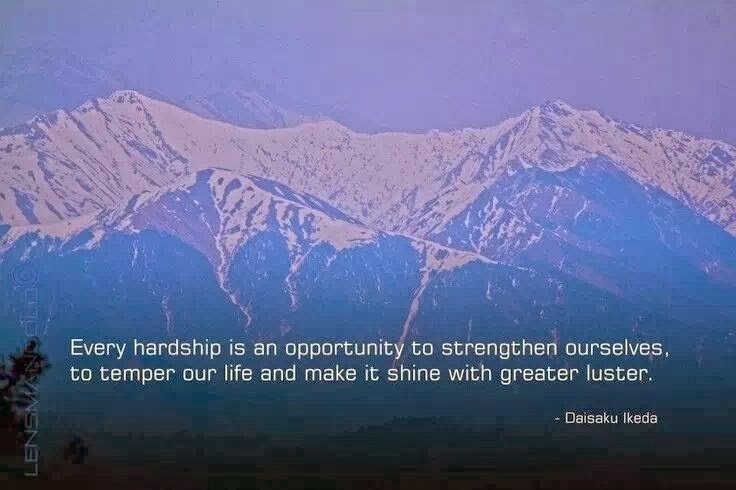 Nam Myoho Renge Kyo ~ Chant For Happiness: Every Hardship Makes our Lives Shine! The picture and the quote above are perfect, since I am in the Great Smoky Mountains right now with no way to travel home due to this great storm we are having in America they are calling "Hercules." My flight from Asheville, North Carolina to Chicago was cancelled, and I cannot get through to the airline to reschedule..even in the middle of the night. United Airlines hangs up on me. Tomorrow I was supposed to start my new job, but I've called my new boss and he is very understanding. There is a huge storm in Chicago. It has been snowing for days. Some areas have more than 10 inches of snow. Tomorrow it will be as cold in Chicago as it will be in Antarctica...13 degrees BELOW zero. My friends in Chicago say "Stay in Asheville!" I am lucky enough to be visiting my Dad and Stepmom here, so I am warm and cozy...but it's weird not being booked on a flight back. I even thought of driving the 10 hours back but the roads are unsafe. I am chanting to enjoy my time with my Dad, for perfect timing in the beginning of my new job, and for all the stranded travelers. I went to the airport yesterday to try to get a flight booked and the lines were filled with people who were in worse situations than myself...with no where to go! I guess a big weather incident is just the way it goes sometimes! 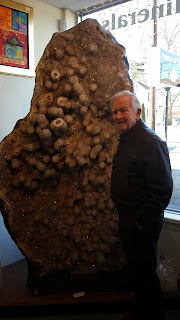 Yesterday in Asheville we visited the amazing Points of Light Gallery and store. 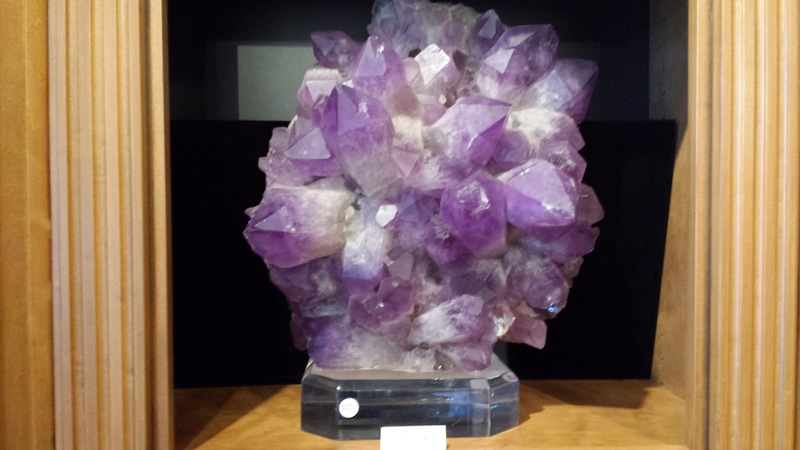 (Pointsoflight.net) It has the most amazing minerals I've ever seen. Here are a few pictures. Enjoy! 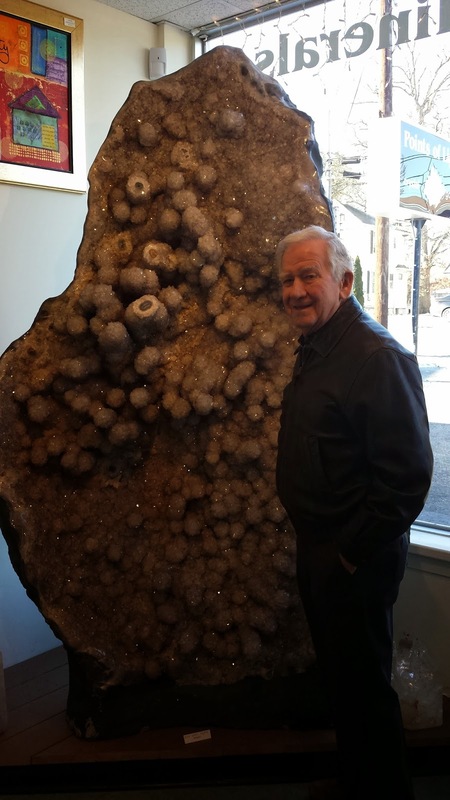 here's my Dad next to it! Today I'll be chanting and trying to arrange a way home. I appreciate each and every one of you for sending me such heart-warming greetings over the new year! You can write me at chantforhappiness@gmail.com ~ and thanks for your Daimoku!